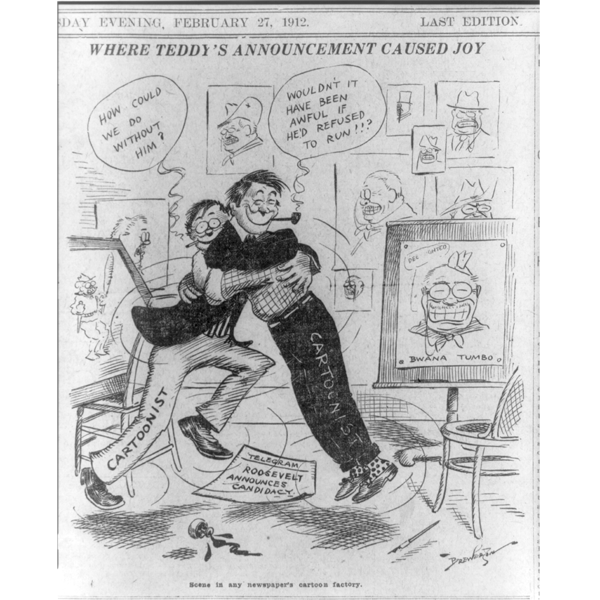 Teddy Roosevelt was a favorite of political cartoonists throughout his public life. His colossal personality and colorful speeches made the job easy for artists such as Clifford K. Berryman, Udo Keppler, and Alfred West Brewerton, whose work is shown here. Clifford Berryman, of the Washington Post, particularly loved drawing Roosevelt. 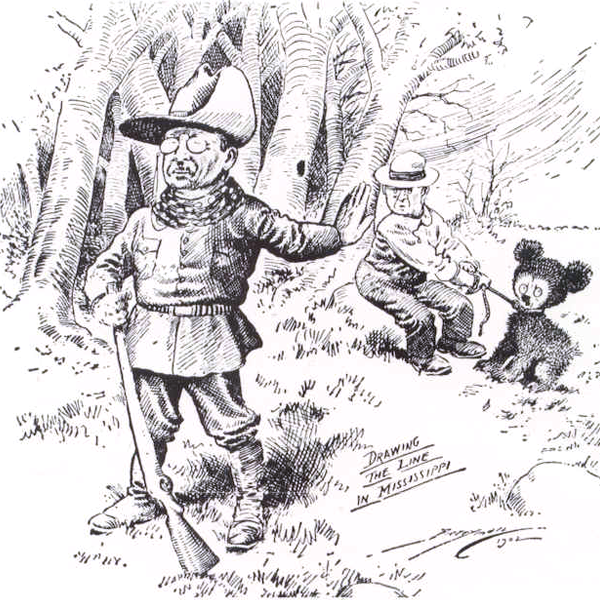 It was Berryman’s cartoon of the president refusing to shoot a sickly bear during a hunting trip that popularized the term “Teddy Bear,” and subsequently gave rise to the stuffed animal of the same name. In spite of this heartwarming tale, Roosevelt was a forced to be reckoned with in office. And quite literally -- he was even known to challenge White house interns to boxing matches. 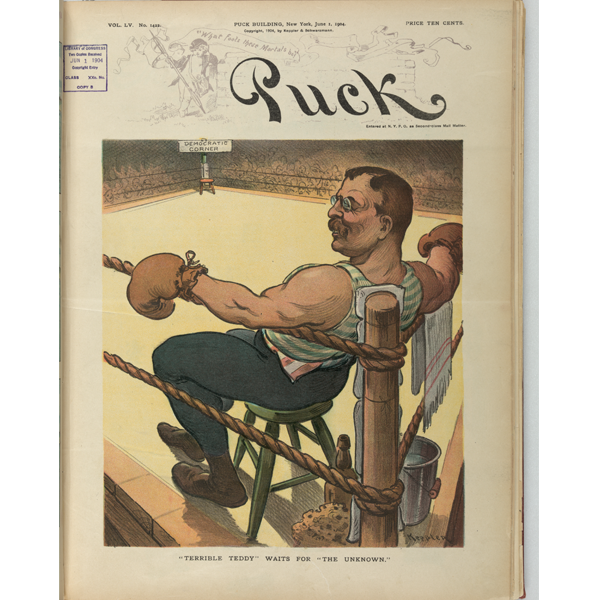 One such intern landed a punch so hard that Roosevelt was permanently blind in his left eye. 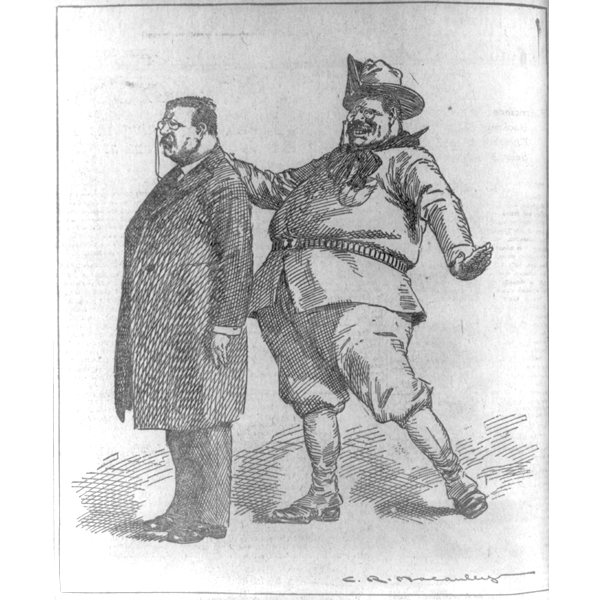 When it came to international politics, Roosevelt managed to put aside his love of roughhousing. He was a master diplomat, and won a Nobel Peace Prize for negotiating an end to the Russo-Japanese War. 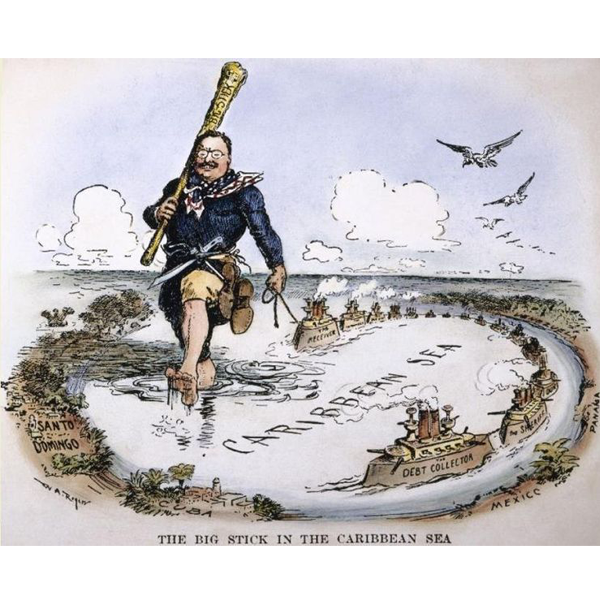 His foreign policy slogan, “Speak Softly and Carry A Big Stick,” became a favorite visual metaphor for cartoonists. 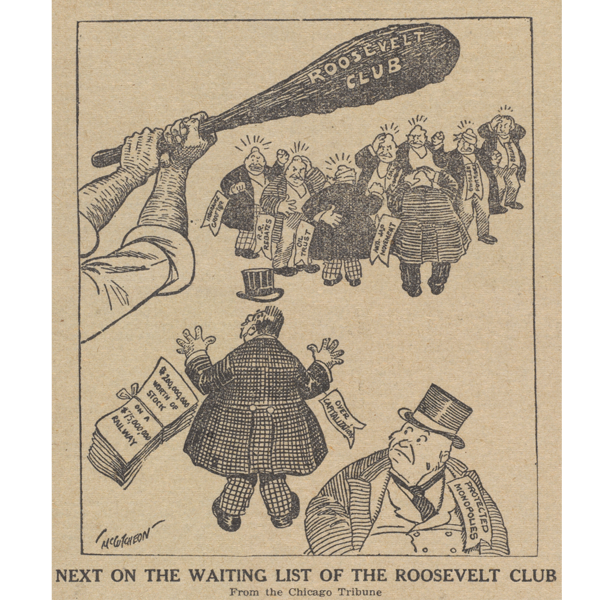 Roosevelt’s signature “big stick” became a recurring theme in many cartoons. It worked especially well in reference to the administration’s unrelenting anti-trust policy which, most notably, dismantled a large railroad monopoly in the Northwest. In 1898, in the midst of the Spanish-American War, Roosevelt quit his position as Secretary of the Navy to organize a battle regiment of cowboys, gamblers and prospectors called the Rough Riders. 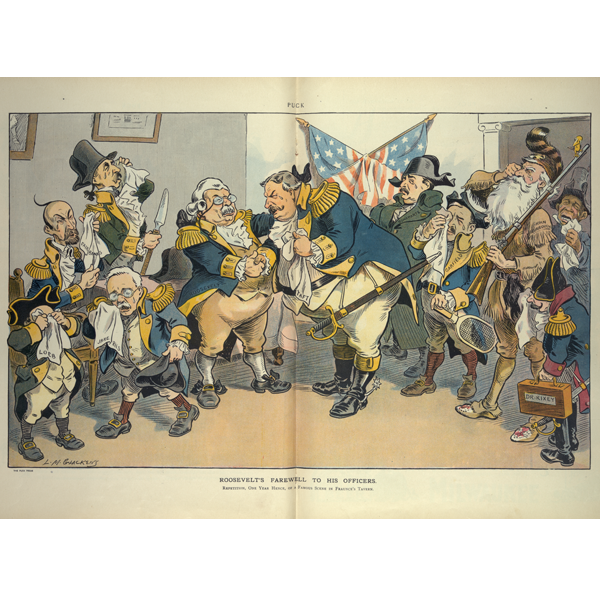 Cartoonists frequently used their uniform as a way to illustrate his rough-and-tumble style of governance. In this panel, Teddy the Rough Rider expresses his approval of Theodore the statesman. Although he was technically allowed to run for a third term, the immensely popular President Roosevelt left office in 1909. In a fitting sendoff, cartoonist Louis M. Glackens depicts Roosevelt bidding farewell to his officers and handing the torch to William Howard Taft, his successor. During his years in office, Roosevelt was regarded as a reformer, a statesman and a champion of the people. 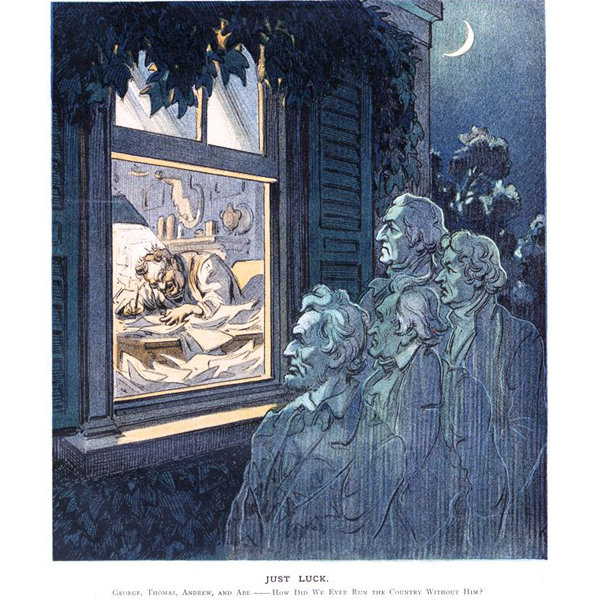 Even today, he remains one of America’s most beloved -- and most animated -- presidents. Watch The Roosevelts: An Intimate History an encore broadcast presentation on THIRTEEN from Monday, August 7 through Thursday, August 14, 2017. See the primetime schedule.